I love muffins, in all shapes and sizes, savoury and sweet, they have my name on it. 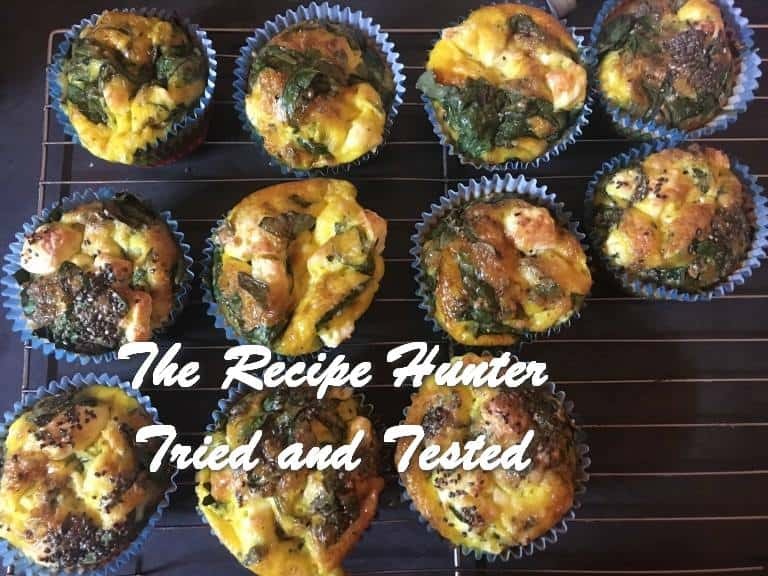 A while back I came across a spinach and feta muffin which I tried over and over again and it never came out right. It rose beautifully and then as soon as they started cool they sunk. I tried everything, from swapping out the feta cheese for cheddar cheese, adding more cheese, baking it longer, adding more flour to make a stiffer mixture but nothing seemed to work. So when I saw this recipe, I knew I had to try it out. I was a bit dubious and I left the room for 20 minutes while it cooled. I was scared that it would sink just like the other batches I tried. But it seems like adding egg and taking out flour worked like a bomb. 2 cups baby spinach, chopped. Mix the spinach and feta cheese together in a bowl. Spoon the mixture into the paper cups. Fill cups about 2 spoons per cup. Remember as this muffin bakes it rises. Using a soup ladle, pour 1 ladle mixture into each cup. If you want you can sprinkle some chia seed over the top before baking. Pop into a preheated oven and bake at 180C for 15-20 minutes or until the tops of the muffins are nice and golden brown. Oh my a lovely #followitFriday. Pleased to greet you.